I have about 100 pages left to read, and even so, this network science book is already declared another winner. Fowler, which have repeatedly made front-page news nationwide. Harvard professor and health care policy specialist Christakis (Death Foretold: Prophecy and Prognosis in Medical Care) became interested in social connectivity when observing that the mortality rate of spouses spike after a partner passes away. Christakis sought out a collaboration with Fowler, a health systems and political scientist, and together they compare topology (the hows of a given structure) across different social networks to better explain how participation and positioning enhances the effectiveness of an individual, and why the "whole" of a network is "greater than the sum of its parts." Five basic rules describe the relationship between individuals and their networks-including mutual adaptation, the influence of friends and friends' friends, the network's "life of its own"-but the results do more than promote the good of the group: they also spread contagions; create "epidemics" of obesity, smoking and substance abuse; disseminate fads and markets; alter voting patterns; and more. 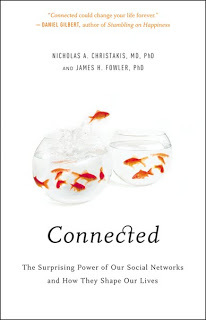 A thorough but popular take on a complex phenomenon, this volume offers an entertaining guide to the mechanics and importance of human networking. 13 b/w illustrations, 8-page color insert.